"Past, Present, and Possible Future of Antibiotics"
A graphic-novel style story by Jonathan Roy, author of Smallpox Zero. The possibility that our most commonly prescribed drugs, which we've relied on for nearly eight decades to kill infections, will stop working — indeed, in some cases, already have — is nearly unfathomable. Each year, more than 2 million people in the United States become infected with bacteria that are resistant to antibiotics and about 23,000 of them die. "Unfortunately this problem is going to get worse before it gets better, and more people will die," says microbiologist David Weiss, director of Emory's Antibiotic Resistance Center. "If you can die from a scrape or a common infection, honestly, everyone's life is going to change a lot." Commonplace illnesses and routine surgeries would once again become life-threatening, and chemotherapy, organ transplantation, and other tools of modern medicine would be off the table. 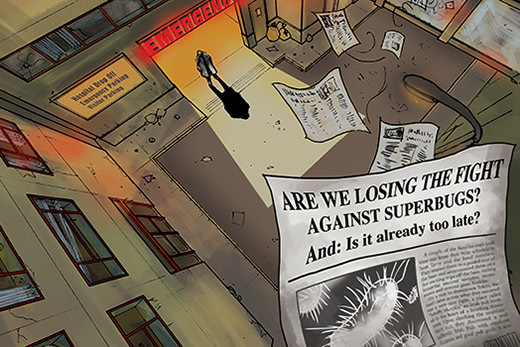 For this story graphic artist Jonathan Roy, author of Smallpox Zero, depicts the past, present, and possible future of antibiotics and writer Mary Loftus profiles several Emory Antibiotic Resistance Center researchers — Emory's own Superbug Squad. "We're standing on the precipice of a post-antibiotic era," says Emory ethnobotanist Cassandra Quave, who is searching for medicines in ancient remedies and promising plants. "We just haven't fallen off yet."